No doubt subscribers and followers of this site are aware of the recent changes SmileOnMyMac has made for the recent update to their highly popular and useful text expansion program, TextExpander. In case you don’t know, the new update, TextExpander 6, is subscription-based rather than a one-time purchase of the application. The basic Life Hacker subscription costs a minimum of $3.96/month, billed annually, or $4.95 monthly. The the new price is now $20/year. Lifetime Discount for Current Customers. TextExpander 6 has the same functions and UI of TextExpander 5, but now all your snippets are uploaded to your TextExpander online account, which means you can more easily share your snippets with other TE 6 users. The subscription also means you will get immediate access to future updates (and email support) of TextExpander for no extra charge. But here’s the rub, most general users feel the subscription fee is much too high, especially if they are not sharing their snippets with a team, and are not using the software for enterprise work. This means that many current uses of TextExpander will probably jump ship and look for alternatives, though Smile says that they will continue support of TextExpander 5 on El Capitan, but after that the support may be limited or nonexistent. TextExpander 5 and 6 are two separate applications. When you download 6, it will import all your snippets from the previous version, and then it will upload your snippets to your account if you sign up. There is a 30-day free trial for the new plan, and I think existing users of TextExpander can get a 50% discount for the first year subscription. Rightly so, many users will not need or want to take out a subscription. 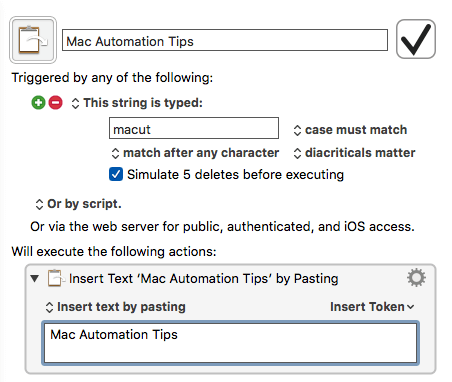 There are several worthy alternatives to TextExpander, including TypeIt4Me, Typinator, aText, and the much more expansive automation program, Keyboard Maestro, which I’m focusing on in this article. Keyboard Maestro’s text expansion feature works similar to TextExpander. 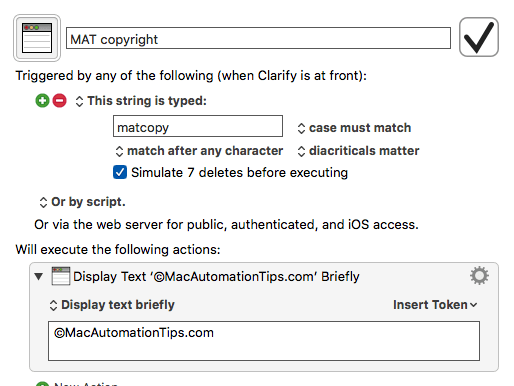 You can create a macro that can paste text triggered by an assigned abbreviation (in KM, it’s called a string trigger). Unlike TextExpander, Keyboard Maestro expansion actions can also insert insert text by typing, as well as insert styled text, and other tokens. Notice also in the screenshot below, that KM can display designated text in a window or in a large overlay. Furthermore, KM text expansions can be triggered not only with string triggers (abbreviations), but also by an application trigger, an assigned hotkey, or by clicking the macro in a Global Palette or menu bar palette. In other words, if you have a text expansion that you don’t use regularly and you can’t remember the assigned string trigger, you can trigger the expansion by clicking on its macro in the global palette. Here’s another example of an expansion I use in KM. 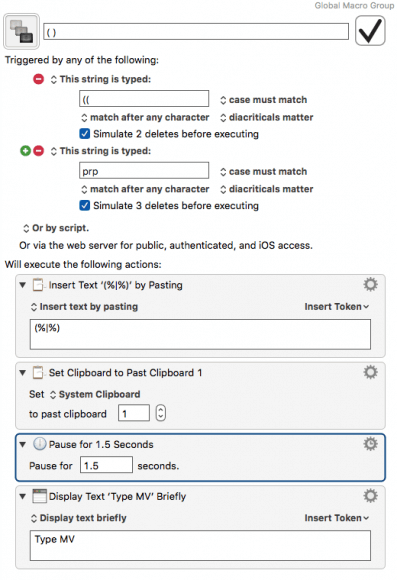 Notice when I use either the assigned string trigger “((” or “php”, KM will paste two parenthesis (), and then insert the cursor between them so that I can type one or more words. 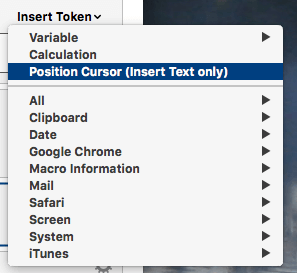 In addition to the inserting the cursor, KM contains other tokens, including inserting a date scheme, the frontmost Safari or Google Chrome URL, or the currently playing iTunes song. This type of expansions can certainly be done with TextExpander (though TE doesn’t have all the additional tokens KM has), but there’s one little feature I’ve added to this macro. Note how the last action in the macro briefly displays, in OS X Notification fashion, a little reminder, “Type MV”, which refers to the string trigger that triggers another macro I’ve set up to move my cursor outside of the last parenthesis so I don’t have to lift my hand off the keyboard to do so. Watch the following short clip to see it in action. As with TextExpander, you can set up KM expansions to work only within assigned applications, such as this one I assigned to only work in the screenshot application, Clarify. In addition, Keyboard Maestro also has a feature called Name Clipboards, which are very advanced and go beyond what TextExpander is capable of doing. Side Note: In the process of writing this article, I discovered that Perter Lewis, the developer for Keyboard Maestro, has posted a macro on his forum site that creates a text expansion from selected text (you might need to join the forum in order to download the macro.) This macro provides a quicker way to get text expansions into Keyboard Maestro, but it still requires a few more steps than is required for setting up a TE expansion using its floating pop-up window. As you can see, Keyboard Maestro is very powerful, and to me it’s the granddaddy of automation programs for the Mac. 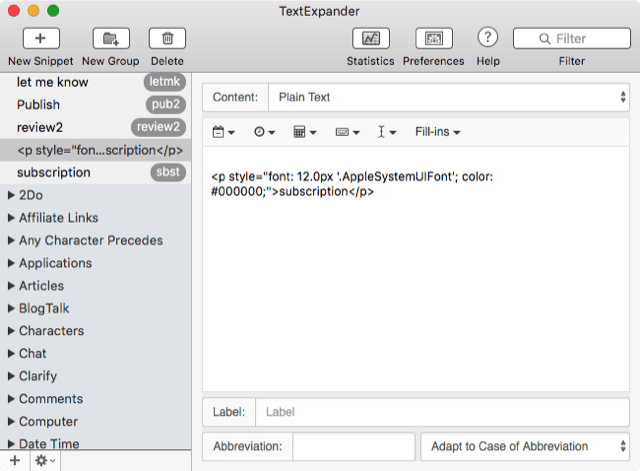 However, there are several I prefer to use TextExpander as my main text expansion program. Its user interface makes it easier than Keyboard Maestro to set up expansions. Expansions can be set up and even searched, in a floating window. The latest version of TE displays reminders of snippets that you forget to use when typing. TE automatically capitalizes the first letter of a new sentence. Very sweet. TE’s iOS version integrates with other iOS apps, such as Drafts. TE also notices and keeps a folder of suggested words and phrases that you type regularly but have not yet created a TE snippet for. And I especially like the TE hotkey that allows for editing your last expanded snippet in a floating window. I trigger this hotkey with a Dragon Dictate voice. 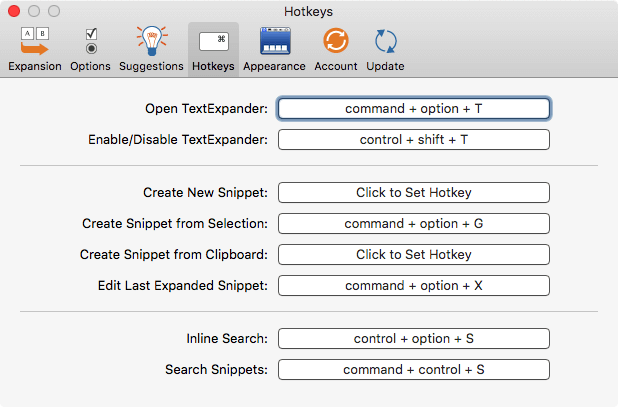 Because of TextExpander’s hotkey features, I can map and trigger its hotkeys using Dragon Dictate, BetterTouchTool, and Keyboard Maestro. 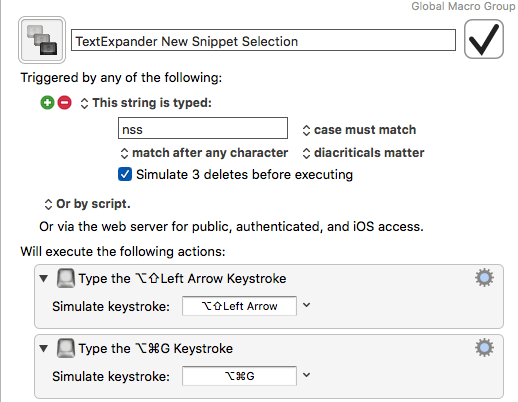 For example, when I want to quickly make the last word I typed a TextExpander snippet, I simply type (“nss”) a Keyboard Maestro string trigger, which triggers a macro that selects the word behind the cursor, and then it triggers the Create Snippet from Selection hotkey. Bam, I can set up the snippet and then get back to typing without lifting my fingers off the keyboard. Watch the clip below to see it in action. I have similar KM and Dragon Dictate actions for other TextExpander hotkeys. These hotkeys are good time savers for heavy users of the program. Note: I also use a PopClip extension that is set up to copy and paste selected text into a new TE expansion. Now as much as I use and depend upon Keyboard Maestro, I wouldn’t recommend it as the best replacement for TextExpander. It requires too many steps to set up an expansion. There’s no inline setups for expansions (except the macro I referred to earlier in this article). I don’t want my KM to be cluttered with too many snippets, mainly because I already have hundreds of other macros that I use the program. KM doesn’t have as many hotkey features as found in TE. Though KM has its own iOS remote app, I doesn’t integrate with other iOS apps the way TE does. If you don’t do a lot of typing on your Mac, but you want a text expansion program for say typing template letters and maybe a few dozen key words and other snippets, then yes Keyboard Maestro will serve you well, and it provides tons more automation features than TextExpander and other similar programs. 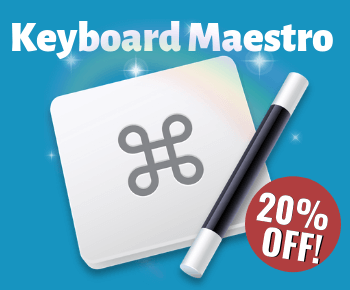 Plus, Keyboard Maestro only costs $36, though it’s worth a lot more. Again, the reasons above do not mean that Keyboard Maestro is not perfectly useful as a snippet expansion program. If you’ve never tried using it, I highly recommend downloading it and giving it a try. My blog has over a dozen articles to get you started using Keyboard Maestro. I don’t think I will abandon TextExpander, though I seriously don’t want to pay the yearly subscription fee. I am all for supporting developers, just as I want to be supported for the work I do, but the fee is going to be just another subscription that I have to maintain, and I will need to make sure that it’s offering me advance features that save me time. Hmm, do I use TextExpander enough to warrant a subscription? I suspect Smile will be adding more useful features in future updates of TE 6, so as of now, I’m now taking advantage of the 30-day free trial, and I will pay for I have paid for a one year subscription to see what updates Smile manages to add. At any time, I can always go back to TextExpander 5 or start using another program. 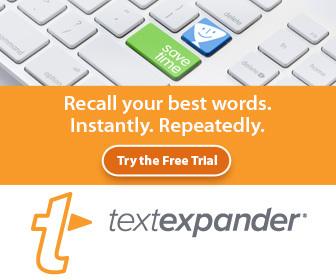 If you’re an existing user of TextExpander, what are your plans for using the program? Will you abandon ship or do you plan to take out a subscription. Do you have other text expansion programs that you’re looking it, or will you use Keyboard Maestro for your snippet expansion needs? 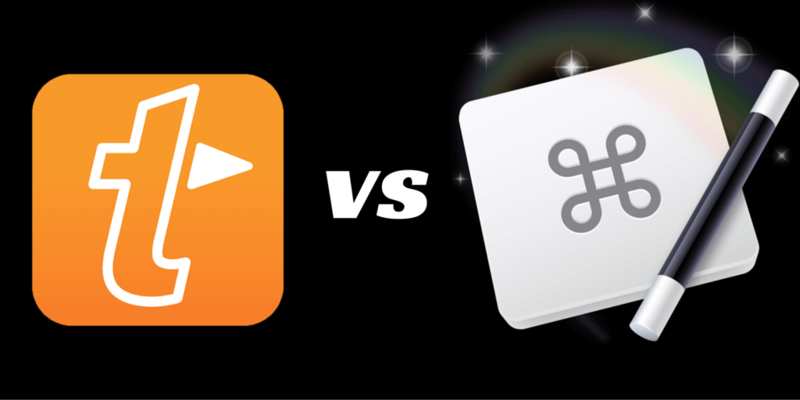 Clicking vs Tapping vs DwellClicking: Which Is Faster? Great article, Bakari. 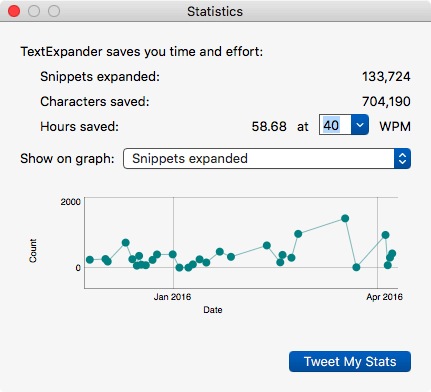 I’m wary of jumping into the TextExpander subscription model, and Keyboard Maestro looks to cumbersome for managing snippets (though I love it for the rest of my macros). I’m seeing that Alfred has some enhanced snippet expansion functionality planned for their next release. 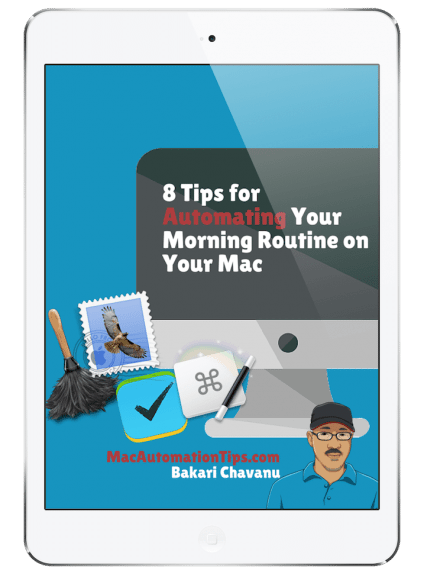 Would love to see a review of that here on Mac Automation Tips when it ships! Thanks Ben for your feedback. I need to check into Alfred’s new feature. I use the program, but I haven’t checked to see if it’s been updated yet. I went ahead and paid a TextExpander subscription, mainly because of the reasons I highlight in the article. And you probably already know that Smile changed its subscription plan whereby existing TextExpander users can lock in a lifetime subscription of $20 per year. But yeah, if I didn’t use TE so much, especially for job related work, I wouldn’t want to pay the subscription either. I’ll check into the Alfred update. I’m pretty sure I’ll write up something about it. Really appreciate your feedback. Keep in touch. Great job on TE vs. KM for text expansion. I am unsure if I will sign up for the TE subscription, I don’t have the need for any sharing, and if I am not connected to the internet, I worry my snippets will disappear. Your mention of KM able to insert text by typing is a GREAT feature. There are some apps that do not allow me to “paste,” so TE wasn’t working. Creating a KM macro to insert the same text by typing works great! Hey Mike, thanks for the feedback. Yep, KM is pretty good about pasting text in most all applications. I use for pasting or typing login information is a few places. Today, I signed up for a TE subscription because they brought the price down to $20 per month. I use the program a lot, so it’s worth the investment, and for the reasons I highlight in the article. I do though expect them to add more features that are worth an annual subscription. I was thinking about doing a Wishlist article for what I would like to see in TE. Anyway, thanks for your feedback. Keep in touch. I’m a long-time user of TE. 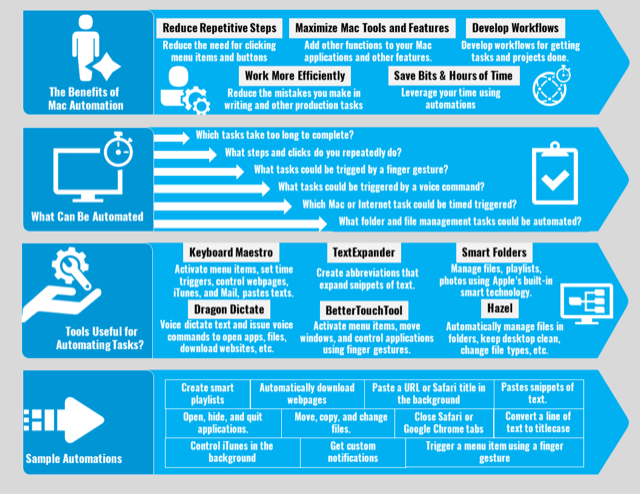 I decided to try KM a few months ago because of some abilities it has to automate a lot of tasks. When I got it, I hadn’t thought about using it instead of TE, but I decided to try. I copied all my TE snippets to KM and signed out of TE on my Mac Mini and MacBook. Worked really well…almost. What do I do about my iPhone and iPad? I used TE quite a bit on them and I’d have to go with an alternative…and they are usually iOS only and do not sync with the Macs. I ended up going for the $20/year for TE. I can rationalize it by saying it’s only $5/year for each device. Not bad for everything TE does, including syncing the snippets between all the devices. So now I use TE for what it does best and KM for what it does best. With Alfred and Hazel and all the tips from Bakari, Don McAllister, and others, it’s a winning combination. Hey Tony, thanks for your feedback. Nice to be in the same company with Don McAllister. Your reasons for using TE mirrors my own. I’m looking forwared to seeing how they upgrade the application over next few years. Please add http://mac.phraseexpress.com to the list of alternatives. It has many additional power features, such versions for Windows, Mac, iOS and Android, multi-level folder structure, reusable autotext, phrase suggestions, nestable macro functions and many more. Okay, I’ll check it out again. Looking forward to seeing how the auto-suggestion feature works.